A kind gesture can go a long way; that’s what students at Andrew Muller Primary School (AMPS) in Miller Place are learning as they continue spreading kindness throughout the building. 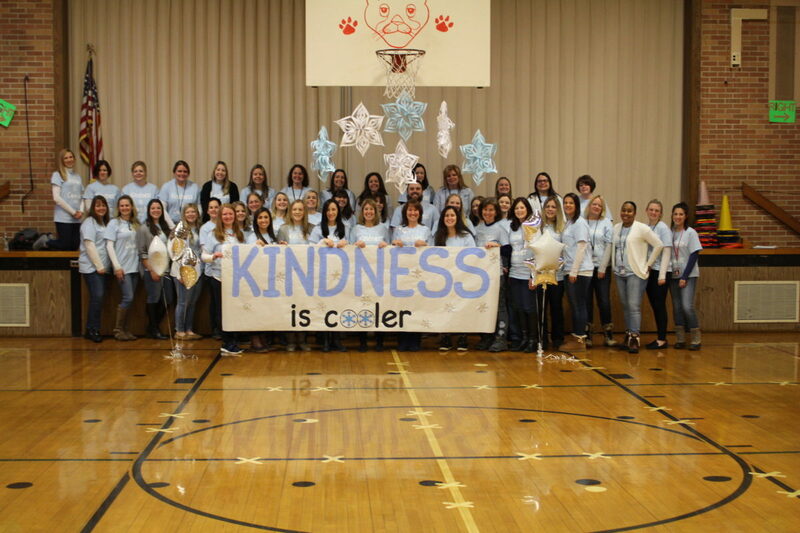 Students and staff recently celebrated “Kindness Day,” a busy day filled with team building activities to promote unity and kindness. To kick off the day, each student had a unique grand entrance—they entered the classroom doors either performing a high five, twirl, dance move, hug, or big smile. Teachers facilitated a morning meeting to discuss kindness and the legacy and message of Dr. Martin Luther King—how he wanted everyone to have equal rights and to be treated based on the kind of person they were, not what they looked like. Kindergarteners began the day with Mem Fox’s Whoever You Are, a book that urges readers to accept individual differences, to recognize similarities and most importantly to rejoice in both. First graders read The Crayon Box That Talked, a story that discusses cooperation and the beauty of working together. Margery Cuyler’s and Sachiko Yoshikawa’s Kindness Is Cooler, Mrs. Ruler was read with second grade classes to teach students a lesson on support and the golden rule: kindness is cool! In each classroom, teachers facilitated several ice breaker activities to better familiarize students in different classes with one another. They discussed their favorite colors and foods, pets and siblings they have, and afterschool activities they participate in. Before lunch, the students created ‘snowballs’ out of paper with their names written at the center. The snowballs were placed in a bucket for students to randomly select from and then share something nice about that student with the class. After reading Dr. Seuss’ The Sneetches, each student cut out a hand on construction paper to write gestures they can do to make the world a better place. Responses included smile, hug, tell a joke, and give a compliment. To conclude Kindness Day, AMPS’s students and staff gathered in three concentric circles for a building wide sing along of “Count On Me” by Bruno Mars. For more information about the Miller Place School District, please visit the District’s website atwww.millerplace.k12.ny.us. 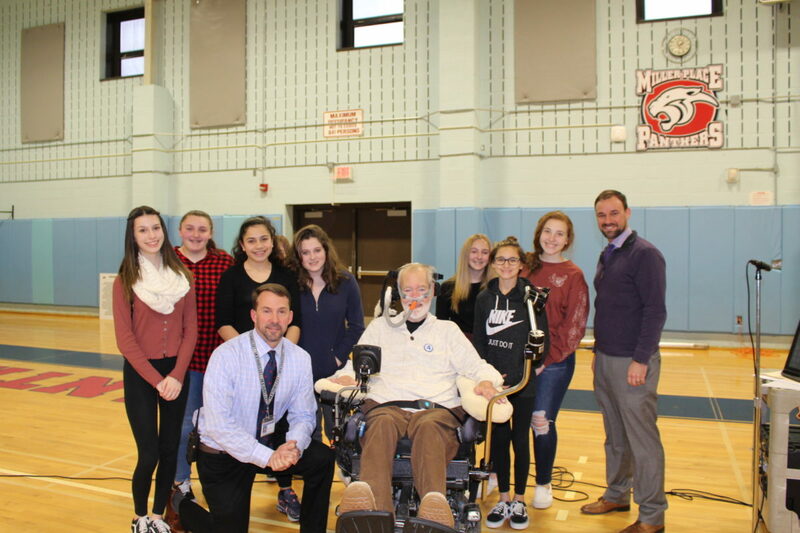 Miller Place School District (MPSD) recently held a special assembly at North Country Road Middle School to raise awareness of Amyotrophic Lateral Sclerosis (ALS). Mr. Chris Pendergast, a Miller Place native and courageous fighter of ALS, returned to the district to speak with students about his journey over the last 25 years. North Country Road Middle School’s students in sixth, seventh, and eighth grade listened attentively to Mr. Pendergast’s story about his advocacy efforts and how his devotion and perseverance inspired the Ride for Life organization, a charity that raises money and awareness for ALS/Lou Gehrig’s Disease. The presentation honed in on an important message for students to never give up and overcoming the odds. Students were also amazed by Mr. Pendergast’s ability to utilize advanced technology equipment to type using his eyes and speak through a computerized voice. For the last 25 years, students and educators across Long Island and New York City have helped Mr. Pendergast raise more than $7 million for research and patient services. This year alone, the Miller Place School District has worked together to raise more than $5,500 for the organization through different initiatives including Kick Out ALS and Spirit Week. 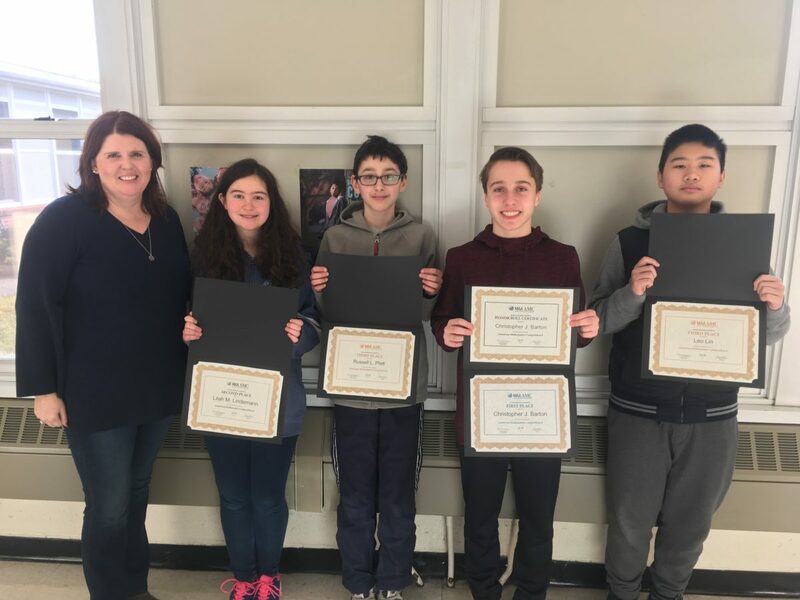 The Miller Place School District’s North Country Road Middle School is thrilled to recognize four exceptional students—Christopher Barton, grade 7; Leo Lin, grade 8; Russell Platt, grade 7; and Lilah Lindemann, grade 8—who were recently invited to compete in the annual American Mathematics Competition for eighth graders. Christopher, NCRMS’s top scorer of the competition, earned a gold medal in addition to an honor roll certificate for scoring in the top 5% of the competition nationwide. Lilah was also recognized as one of NCRMS’s highest scorers and received a silver medal for her accomplishment. Leo and Russell’s hard work and dedication earned them each a well-deserved spot in third place—both took home a bronze medal for their scores. The AMC 8 competition is designed for middle school students and its purpose is to provide an opportunity for 8th graders to demonstrate their knowledge and ability in the area of mathematics. Students participate in a 25-question, 40-minute multiple choice examination designed to promote the development and enhancement of problem solving skills. Congratulations to all involved, with a special thank you to Mrs. Maureen Radday, math teacher at NCRMS, for all of her efforts in providing this opportunity for our students. 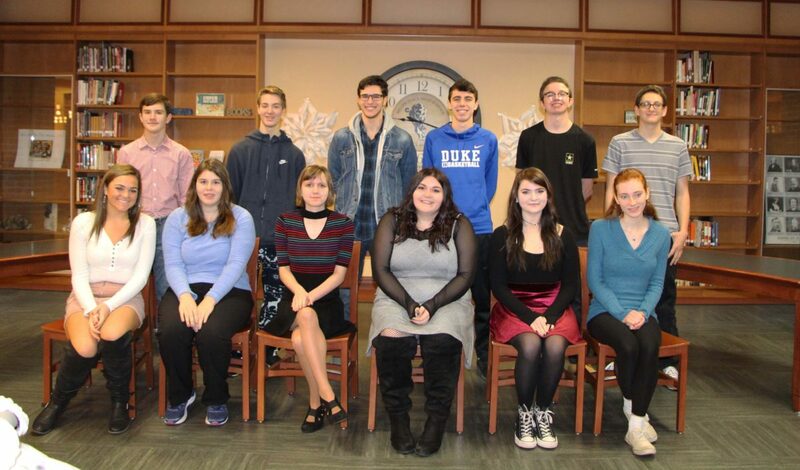 The Miller Place School District recently recognized 12 students from Miller Place High School for their random acts of kindness and stellar educational achievement. Students either received an Outstanding Acts of Kindness (OAK) or Outstanding Academic Recognition (OAR) award at a breakfast in the presence of family and friends. Students who qualify for the OAK award have been “caught” in the act of being great by displaying selfless behavior. One example is when a student helps a peer or faculty member in need with no expectation of material return. These students demonstrate the sense of spirit the District aims to achieve throughout the school community and serve as role models for others in the building. Recipients of the OAK award this year include Tristan Bailey, Jake Froese, David Miekley, Mary Rozensky, Jack Soldano, and Christopher Waldemar. To meet the requirements for the OAR award, students must distinguish themselves as academic inspirations and have successfully risen to the educational challenges presented to them. These students either met long-term goals or are students who have exhibited commendable improvement. This year’s recipients include Alexis Biscardi, Dylan Flerx, Charlotte Gann, Ann Marie McNulty, Lily Newman, Emma Walsh. The Andrew Muller Primary School (AMPS) in the Miller Place School District will be holding Kindergarten registration from Monday, March 25, 2019 through Friday, March 29, 2019 from 9:45 a.m. – 3:00 p.m. Registration is by appointment only. Parents are asked to call the AMPS main office at 631-474-2715 to schedule an appointment. Parents interested in registering a child or children to enter kindergarten during the 2019-2020 school year must ensure each child has met all age and health requirements mandated by New York State. Information and required forms are available online on the District website. Parents should print out these forms, complete them in full and bring them with all required documentation to the scheduled appointment. Only children who will be five years old on or before December 1, 2019 and are residents of the Miller Place School District are eligible for registration. New York State current mandated immunizations include: 3-4 Polio (IPV), 4-5 DPT (DTaP/DTP), three Measles/Mumps/Rubella (MMR), three Hepatitis B, two MMR and two Varicella. Parents should also bring each child’s current immunization record to registration. New York State law requires that all prospective students complete a physical examination within one year prior to the first day of school, and the completed examination form must be submitted to the AMPS Health Office no later than August 22, 2019. The mission of the Miller Place Union Free School District is to educate all students to their fullest potential by providing opportunities for learning that are challenging and effective. This education will enable all students to master the knowledgeable skills, strategies, and attitudes necessary to become lifelong learners and responsible citizens. The Miller Place School District has an enrollment of 3,200 students in grade K-12, an enrollment that has been steadily increasing over recent years. The educational programs and services offered to Miller Place students underlines the District’s mission for academic excellence and the invested interest in the development and success of each individual student. Visit the “In the Media” section to stay up-to-date on all the accomplishments of our students and the initiatives and events in Miller Place schools.